If you are looking for a super easy recipe for a weekday meal this is it! 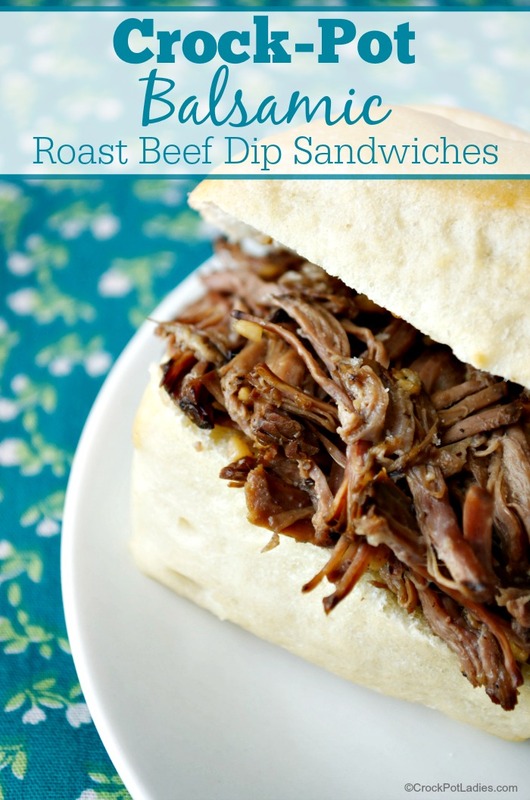 This easy to prepare Crock-Pot Balsamic Roast Beef Dip Sandwiches hit the spot! The sweet and tangy balsamic vinegar really adds the right touch to these delicious sandwiches! If you are looking for a super easy recipe for a weekday meal this is it! This easy to prepare dish is just the thing needed on a busy day. Moist and full of flavor you will not want to pass up this recipe! The balsamic vinegar helps break the meat down into total tenderness as well as adding a pleasant tang to the dish while the honey adds just a touch of sweetness. All the other flavors round it out for a perfect symphony of yum! 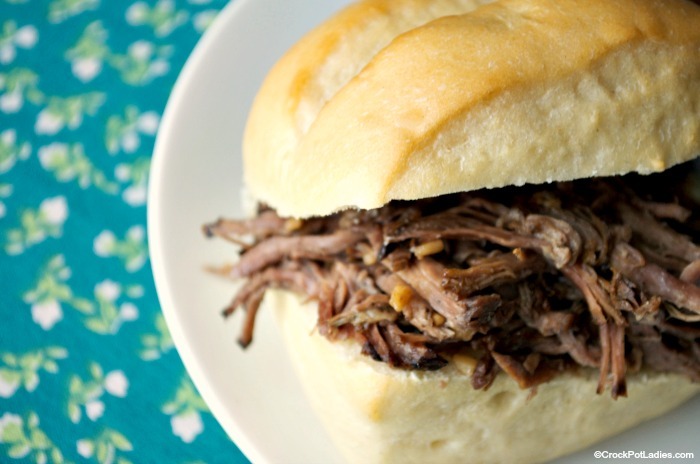 Balsamic vinegar adds just the right flavor to these shredded beef sandwiches. 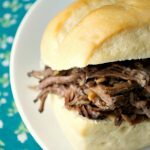 The meat cooks away all day in your slow cooker so all you have to do is shred the meat before adding it to your favorite buns or rolls! Place your roast beef in a 6 quart or larger slow cooker. In a small bowl mix the rest of the ingredients and stir well to combine. Pour liquid over beef in slow cooker. Cover and cook on LOW for 6 to 8 hours or 3 to 4 hours on HIGH. To serve remove pot roast from slow cooker with tongs and shred lightly with the tines of two forks. Serve on nice French roll buns or any bread of your choice. Pour 1/2 of the pan juices over the shredded meat and serve the extra au jus as a dip on the side for your sandwiches. Nutritional information based on the ingredients for the meat cooked in the slow cooker and does not account for any bread, rolls or buns that you may serve it on. For low carb serving options you may want to wrap the shredded beef in lettuce leaves or in low carb wraps. This recipe was first published in February 2013. And we have decided it was time for an update. New photos, as well as special diet and nutritional information has been added. We hope you enjoy! Can’t wait to try these! Look wonderful. Thanks Terry, I hope you will enjoy this recipe! Oh, thank you so much for sharing this at http://www.meltingmoments.info I can’t wait to check out your blog! I love crock pot recipes. Looks so good. Have in the crockpot, ready to go for tomorrow morning. I love it when I am actually organized enough to do that! Thank you for the recipe. Thanks Laura for the heads up on my recipe boo-boo. I will fix that right now. I hope your family enjoys this recipe as much as mine did! Come back and let me know how it turned out for you! I am so glad you enjoyed it Diana! My parents made this recipe and were displeased with how dry the beef turned out. ITS IN LIQUID. WHY WAS THE BEEF DRY. I am sorry your parents beef turned out dry. It could have been a bad cut of meat with very little fat on it or they didn’t cook it long enough. the key to “fall off the bone” meat in a crockpot is to make sure there is fat or liquid and to cook the meat long enough in that slow and low heat environment to melt the fat and connective tissue in the meat to turn it super tender. The only exception is bonesless/skinless breasts as they have no connective tissues and very little fat they tend to dry out in the crock-pot unless there is a lot of liquid. Apology accepted Heidi, that’s some very tasty info on making “fall off the bone” meat! Good to know so we can lessen the chance of having DRY BEEF again. I’ll make sure they cook those buggers long enough. 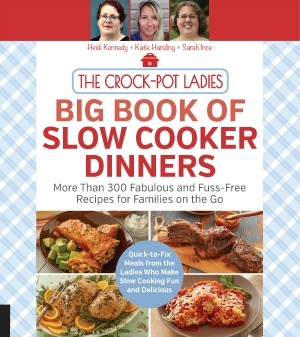 Our future crock-pot endeavors will be improved with your delicious knowledge. This was amazing! I added just a splash more balsalmic (end of bottle)..and melted a little swiss cheese on the assembled sandwich.. I did turn the roast over about halfway through cooking to get the fullest flavor and it was perfect! The Swiss cheese addition sounds amazing! These were delicious! I seasoned the beef beforehand with garlic salt + freshly ground pepper. We used the leftover meat + some yellow gold potatoes for a play on “beef corn hash” for breakfast. I recommend chuck roast for even more flavor, although boneless round is yummy, as well. I’ve made it both ways. I made this for tonight’s supper – 2 Thumbs up from my family. And I agreed! Very tasty and so simple. If I decided to do this in a pressure cooker, what would the instructions be? Hi Tony, this is a Crock-Pot blog not a pressure cooker blog. We don’t test our recipes with other cooking methods outside of cooking in a Crock-Pot. Sorry we are not much help! Thank you so much for this recipe -it is one of my very favorites! So easy. I use an espresso balsamic vinegar,and leave out the honey. You’re welcome Margo. I am going to have to look for an espresso balsamic vinegar…that sounds amazing! just put it in the crockpot, looking forward to dinner tonight!! Hope you enjoy the recipe Teri!